Read part 1 of "Eighty-three" Read part 2 of "Eighty-three" Read part 3 of "Eighty-three" Read part 4 of "Eighty-three" Read part 5 of "Eighty-three" After countless hours of winter practice in late 1982 and early 1983, the Cadets began a surprise run at the DCI trophy in 1983 almost as soon as the season started. Corps director George Hopkins had a simple axiom for the corps rehearsals as the season began: "Work hard! Get it right." Eric Sabach: As marching members, we wanted to be different. Doing anything, playing anything, or even how we approached rehearsing, we wanted to do it better than anything before and with more dedication. I'd hate to say that we were a machine, because we were not. We were something more -- a tremendous synergy was taking place between all the staff, the members, the support crew, and the show. It was amazing and very special. It seemed like each rehearsal brought a greater expectation of what we needed to be and what we could become. We wanted to be cleaner, faster, louder, softer, subtle and genuine. I think the staff also knew that they had a corps of members that would never say, "We can't do ..." or "We're tired." We wanted more and they knew it. Michael Jones: We practiced so much that spring leading to the season. The "Mass" was a mass mess going into the first show. We just did what we were told because, yes, we knew there was something. Patrick Zampetti: The overriding concern was maximizing musical effect and raising the level of performance. We knew the show could win, but not without a lot of hard work. Jim Prime: The show performance situation entering the 1983 season had an optimistic slant. The corps was on top of its game at the start of the season. Withstanding some inevitable bumps in the road, the momentum generally continued through the early season, the big checkpoint show at Whitewater DCI Midwest, and into the closing few weeks. The Garfield Cadets. Photo taken from the 1983 DCI program book. 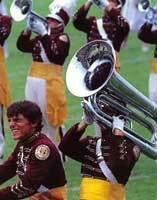 At each contest that summer, the startling drill and breathtaking music wowed even the most seasoned drum corps veterans.^Wayne Downey: I first witnessed the 1983 Cadet show at the Manning Bowl in Lynn, Mass. (on June 11). I can vividly remember how awestruck I was with its newness and innovation both visually and musically. The velocity of the motion of the drill, combined with the complexity of George Zingali's visual design, augmented by the freshness of Jim Prime's arrangements, blew me away. I knew that night standing on the roof of Manning Bowl that the Cadets had set a new standard for the activity and that there was a new benchmark for excellence in design set for the activity by this young and very talented design team. Adolph DeGrauwe: I remember when they introduced that "snake-like" drill section (the Z-pull). They went backwards a lot. One guy fell, and it created a domino effect -- several people then fell. And they still won. They were the ones introducing that (fast-paced) drill. We were not in that category quite yet. Corps members agree that the turning point of the season was a series of shows in Wisconsin toward the end of the season. Johnny Sanchez: From a competitive standpoint, the show in Madison, Wis. (on July 29), which was the night before Whitewater, was huge. We were undefeated up to then and pretty much unchallenged competitively. That night we saw the Blue Devils and Santa Clara for the first time. Winning that show made us legitimate contenders. It was very exciting. Brian Wilkie, Sr.: Our focus and new philosophy on competition would not be truly tested until our first meeting with the Blue Devils at DCI Midwest prelims in Whitewater, Wis. (on July 30). Competitively, the Blue Devils were determined to put us in our place, tired (I'm sure) of spending the entire summer to this point hearing and reading about us every week in Drum Corps World. As our gate time approached, which was just before theirs, we walked leisurely as we always did, single file, toward the "business end" of Warhawk Stadium. The stroll from our brass warmup, around one of the campus buildings, unfortunately, took us right into the Blue Devils' brass warmup. As we quietly walked behind their horseshoe, they suddenly stopped playing. All at once, they collectively turned around to face our column -- and screamed at the top of their lungs directly at us in an apparent attempt to psyche us out. All I could think of at that point was "George is right. Focus on what WE can control. Right now, they're not." Patrick Zampetti: As we walked by, they did their best to intimidate us with lots of growling sounds and menacing body language. We countered this aggression by imitating the Monty Python characters when they come up against the killer bunny rabbit in the "Holy Grail" movie, yelling, "Run away, run away!" in our best English accents as we scampered away in mock fear. Scott Litzenberg: We knew they were worried when they acted like that! Brian Wilkie, Sr.: We had a nice chuckle and just kept strolling by. It honestly helped relax us. I think it infuriated them that we didn't react at all. "Win-at-all-cost" was gone. The new philosophy was sound and our focus was true. And we won both prelims and finals that day, by a substantial margin for a championship show.